Alright kids, enough playing around. It’s time to get food serious over here. 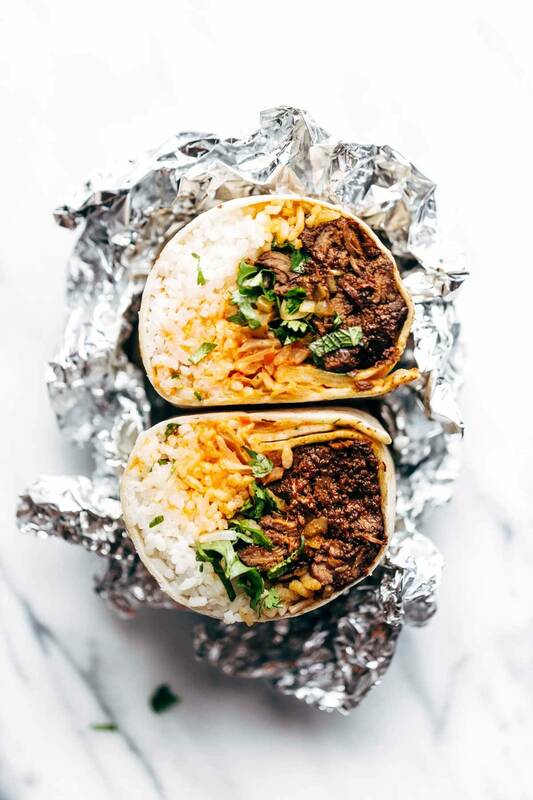 Let’s start by loading a soft flour tortilla with ridiculously tasty garlicky-n-gingery beef, spicy kimchi, steaming white rice, cilantro and basil and just generally herbs to the max, and a big dollop of yum yum sauce. Like a burrito mashup. And then we shall follow that up by loosely calling it a fusion-style Korean BBQ Burrito. The ultimate definition of food serious right there. And now, for a brief breakdown of all the ways in which this recipe and recipe title is delicious and not technically correct. First – the meat is not *technically* BBQ as in hot grill BBQ. I put it in the slow cooker because it was easier that way. And then it turned out SO DELICIOUS that I couldn’t go back. So, I dunno, go on and judge me. But also, BBQ would also be delicious. Second – Korean is a loose descriptor. I claim no authenticity (it’s a Korean burrito, so right there we’re in trouble). I DID watch several videos to learn how to make Korean-style beef and I AM using kimchi to attempt legitimacy, but mostly this is just me playing around with the beloved flavors and styles of Korean-influenced, Mexican-style street food. And finally, for an exciting piece of news: these are actually SO easy to make (see pics with labels) and they will provide you with a heavy duty bangkok burrito stock pile for your freezer which is awesome for times like, say, just as an example, the empty-fridge day after a Fourth of July weekend. We may or may not have made these into loaded tacos over the Fourth of July weekend and our besties may or may not have declared them the BEST TACOS they’ve ever had and if you need me I’ll just be over here making triple batches of the meat for future taco and burrito needs, okay? Fusion food at its finest! Korean BBQ Beef, rice, kimchi, and yum yum sauce all rolled up in a soft flour tortilla. KOREAN BBQ BEEF: Thinly slice the beef and pulse the pear, garlic, and ginger through a food processor. Put all the ingredients for the beef in a slow cooker. Cover and cook on high for 3-5 hours or until very tender and delicious. 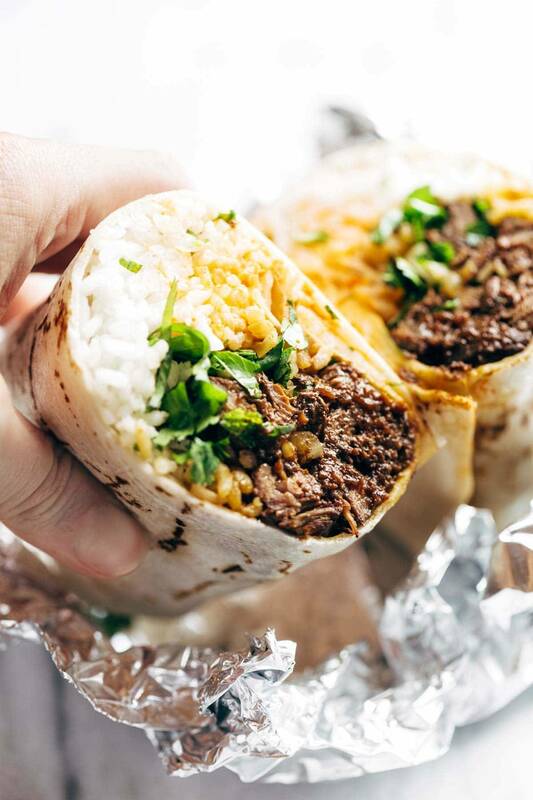 Prep all your burrito fillings (cook the rice, mince the herbs, prepare the sauce). Warming the tortilla a bit makes it easier to roll. I’ve also done the meat on low in the slow cooker for about 9 hours and it was still really good, but a little more dry than the shorter time on high heat, so go for the shorter time if you can. I’ve also done this in a traditional BBQ sense (like, on a hot skillet or grill, for example, this recipe) and that is equally as good. If you can’t find kimchi, just toss a store-bought coleslaw mix with the spicy mayo or yum yum sauce. You won’t get the tang of the fermentation, but the crunch is on point. Also — extra filling makes for great tacos! Guys, these are high calorie. We just need to face the facts. Or not face the facts. I am not including nutrition facts for these because they would vary so much based on how much of each ingredient you put into your burrito. Burritos are just so personal, ya know? But pro tip – if/when you need to eat this and you don’t want it to be the biggest meal of your life, you can a) drop the rice (sad, but I’ll understand) or b) eat all the fillings sans tortilla in a bowl! Korean BBQ Burrito Bowl? Winning. Maybe a dumb question but when you say thinly slice the beef, do you mean into bite sized pieces or large chunks that are thinly sliced? Pretty sure you can do it any way you like it… I cooked my cut of meat whole and then shredded it after it was fall apart tender. Made these last night and followed recipe exactly. WOW – These are really good. Nice combination of flavors. I will be making these again. By the way – I personally loved the name of the recipe. It intrigued me to make these and fits well with the concept you were aiming for – that fusion of tasty tidbits all wrapped up in one. Thanks! Thanks, Robin! Glad you enjoyed them! These are delicious! I didn’t cook the meat in the slow cooker. I had leftover bulgogi and used it in these burritos. The herbs make it! I used all 3 and kimchi and Korean cucumbers. Fantastic! I love your blog and your recipes. It’s been awhile and I’m back for back-to-school easy recipes. I came across this and I was like “wow!” Not in a good way. As an Asian American, the name of this dish is so egregiously ignorant and makes you sound like a person who knows nothing of the East and it’s people. I know you were going for fun and a mashup by putting together a bunch of Asian regional names. However, the result of lame. As you mentioned the two regions in this dish have nothing to do with each other. It’s like calling something Mexican-Venezuelan because it had beans in it (equally egregiously ignorant). I had to call you out on it because I love you. You are better than this. Hi AW, thanks for the input. The name came from the restaurant where this burrito was inspired since they call all their fusion burritos “bangkok burritos.” I did not think through the insensitivity of their name and appreciate this feedback. Title has been changed. I had some friends over last night and made these burritos. Everyone loved them and laughed about your comments on the calorie content. Totally worth it! Glad to hear it! 🙂 Thanks for the comment! Absolutely love this recipe! Have made it multiple times! However, the meat was tough the first two times. Talked to my butcher and he said I might have better luck with a different cut of beef. Tried an eye of round roast and it was much more tender! Glad to hear it! Thanks for the tip! I’m a big fan of your blog,your recipes are soooo delicious! Question do you have a suggestion à substitute or recipe for Kimche, I live in Québec and I can’t find it in my local grocery store. I had some cooked sliced London broil so heated it up with enough Korean BBQ sauce to flavor. Otherwise made the burritos with all the ingredients plus a baby kale mix. Fantastic, & so different than our usual fare. Thanks! These were fantastic! Just like WSK. You mentioned freezing leftovers. How do you recommend reheating? I’m debating whether microwave or oven would be best. what kind of pears did you use?? asian or any regular pear? Quick question: you mentioned you freeze these for easy dinner. Do you defrost in fridge and reheat? 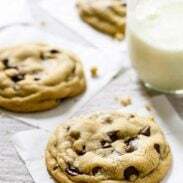 We’re usually able to just reheat them in the microwave from the freezer, but you can definitely defrost first instead! This came out ridiculously good. The flavours and textures are great together. One of my favourite recipes of yours to date. 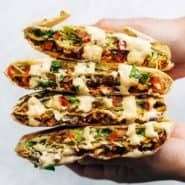 I know this is an older post, but I just found it and am making these burritos this weekend for lunches next week. They look delicious! Just a couple of quick questions on the freezing though…The herbs/kimchi/cabbage freeze up ok in the burrito? Also, how do you warm them once frozen? I made this for dinner and really enjoyed it! I made my own sriracha mayo and reduced the brown sugar used. but this weekend, I’m making this! It looks so incredibly delicious. Had some thin cut ribeye that I needed to use up (picked up from local Asian market). Followed the recipe substituting the top sirloin for the ribeye. Was amazing. Family loved them. Thanks for the great recipe. OMG this was so delicious. And juicy! And simple to make! Was able to cook my husband lasagna and this at the same time with out losing my mind. Just throw it cooler and let it do the rest. No way he’s eating a wrap and lasagna lol. I kinda don’t want to share lol. Thank you for posting this recipe! Love it! Glad you enjoyed it, Cindy! Am i to put the sirloin in the food processor? I am not clear on that step… I want to make the burrito this weekend. Been drooling over this recipe for a month now. Hi, I’ve got this in the slow cooker now but it is looking very soupy. Should I leave it uncovered so the sauce can get a bit more caramelized? You could definitely give it a shot! Glad to hear that, Lucy! While I appreciate and love the melting pot that has become Fusion Cuisine, it is quite ignorant to be naming this a “Korean Bangkok Burrito” when there is no Thai influence. It’s problematic to just name drop countries just because you think it is “exotic”. By the way, Korea and Thailand are not close to each other geographically. Hi Rita! Thanks for sharing your input on this. I have updated the recipe name. Video says 3-5 hours on low. Recipe says 3-5 hours on high…I’m confused! When making this in the crockpot, do you add soy sause and brown sugar to the pear purée? These look great!! What kind of top sirloin did you use? A roast or sirloin tip steak?